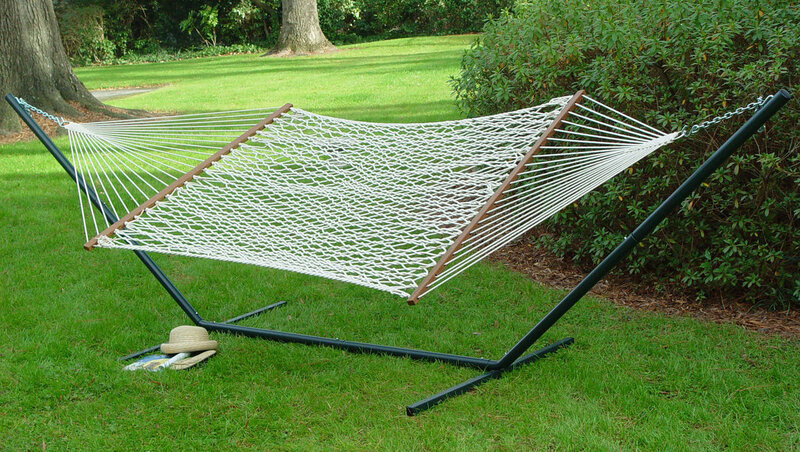 A gathered-end or “Brazilian” style hammock is meant to be hung with a deep sag so you can sleep diagonal to the center line. The hammock in this photo is the KAMMOK ROO. People in South American have a tradition of sleeping in hammocks that dates back thousands of years. The traditional Mayan or Brazilian[1. I use the terms “Mayan,” “Brazilian,” or “traditional” to refer to any hammock that has a gathered-end design. There are distinct differences in gathered-end hammocks in terms of materials or fabrics used, but they are pitched and hung in the same way. Some argue that the Mayan hammock with its tightly-woven mesh is the most comfortable gathered-end hammock since the material stretches in a unique way to provide more comfort in commonly strained areas like the head, knees, and ankles. Your mileage may vary. ]-style hammock is simply a rectangular fabric or tightly-woven net that is gathered at the ends and hung with a low, deep sag that looks much like a smiling face. The suspension lines coming from the anchors to the hammock create a 30 to 50 degree angle. The sag creates a deep pocket that keeps the center of gravity low and stabilizes the occupant inside. The amount of sag is determined by the size of the hammock. 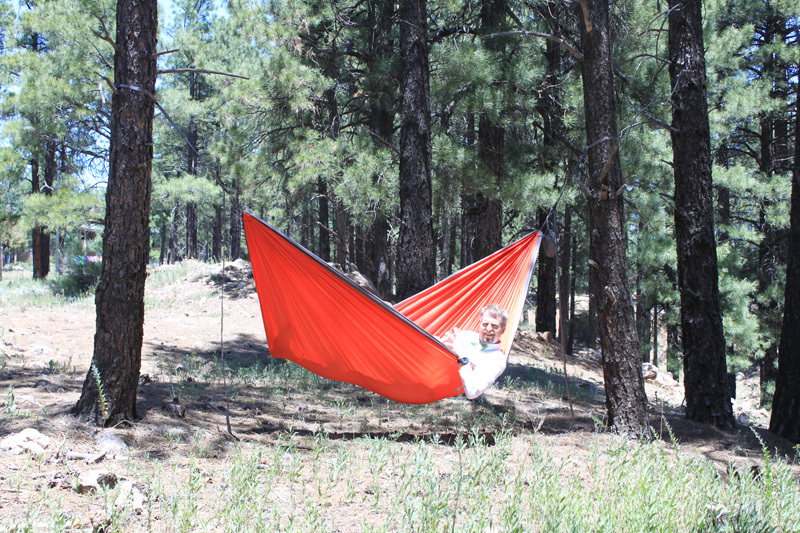 If the hammock is long, for example the KAMMOK ROO pictured above is 72 x 129 in. (183 x 328 cm), having a deep sag improves the comfort and diagonal lay. 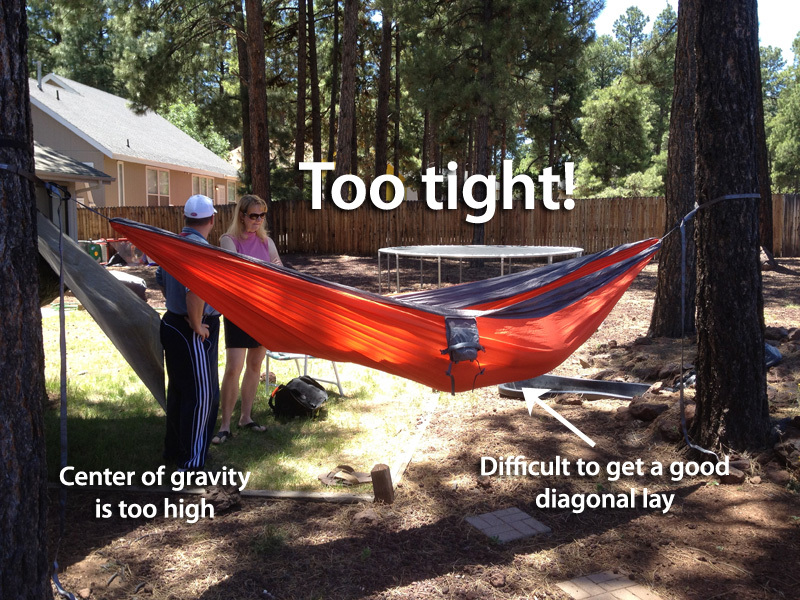 For smaller hammocks, for example the Grand Trunk Ultralight is 54 x 114 in (137 x 290 cm), a shallower sag is better. <!– This video clip is a little quirky (skip ahead to 0:38 where the video really begins), but it shows a "local" explain how to hang and sleep in a Brazilian hammock the traditional way. To sleep in a Brazilian-style hammock, enter by spreading the fabric apart the fabric and sitting down in the middle. Next, swing your legs inside. Lay down in a diagonal position with your feet right of center and your head left of center (or vice-versa). The diagonal lay is the key. Again, the longer an wider the hammock, the deeper you can hang it, and the more diagonal you can lay until you can turn nearly perpendicular. The design of the Brazilian-style hammock and the sleeping method are tried and true, yet most people I meet have never seen a hammock set up correctly, or think of the more modern spreader bar hammock with the thick ropes. Spreader bar hammocks are typically pitched tight to achieve a “flat” lay. The problem with this method, and the spreader bars that hold the hammock fabric or rope, is that it raises the center of gravity making the hammock prone to tip. In addition, most people instinctively try to lay end-to-end, just like on a bed, and end up in a “banana” shape and not flat at all. If you try to pitch a Brazilian-style hammock with a tight pitch (nearly horizontal), you will create a “canoe” effect where the sides are pulled taut and the middle sags down. It is nearly impossible to sleep on the diagonal when you pitch a traditional hammock too tight. One side effect of a tight pitch is excessive shoulder squeeze as the hammock turns your shoulders inward. Another side effect is the excessive weight load you put on the anchor points. Hammock manufacturers and retailers conservatively rate their hammocks below their true breaking point as a liability protection, so some people mistakenly think it’s no big deal to have “excessive strain” because the hammock hasn’t ripped yet. Let’s just say I warned you. There are a lot of hammocks on the market today, and not all are created equally. While I haven’t done the math on hammock dimensions yet, I’m convinced there is a relationship between hammock width and length that makes a “perfect” hammock (could it be the Golden Ratio?). In my own experience I’ve found that longer hammocks are better, all things being equal. If a hammock is really wide but lacks length, the extra width is wasted as you won’t be able to hang the hammock deep enough to take advantage of it. In other words, the wider the hammock, the longer it needs to be. Great work. I have been researching some information about hammock width this article was a lot of help. The model I was considering had three different widths (one was nearly 8′ wide) but the same length hammock as the more narrow ones. Guess its true what they say; “sometimes less is more”. I know ENO sells a few models that are all the same length but different widths. I wish they would make the wide ones longer as it would improve the overall design. All things considered, the narrower hammocks at that same width (ENO models) are the best deal since the extra fabric is wasted and just flaps in your face when you sleep. I’m lying in a Brazilian hammock right now =) I think you’re right about having the correct ratio of length to width, but I also think this can be mitigated through the use of mini spreader bars, which mimic the geometry of a longer hammock. I’ve often wondered about mini spreader bars in gathered-end hammocks — not to duplicate a rope hammock, and certainly keep the signature deep sag, but to keep the side rails from going taut. I’ll have to give it a try. Often I just direct them to your website. Thank you. so helpful on the Golden ratio!!! It should work fine 🙂 if we only count the fabric dimensions, I guess, the rope shouldn’t really count, should it? If you’re talking about the suspension, than yes. Some hammocks use nettles that should be considered part of the overall length. Thank you for your article! I’m trying to figure out how wide the hammock needs to take advantage of the diagonal lie. The hammock I’m looking at is 9′ 10″ Long x 4′ 7″ Wide and I’m 5’5”. Wondering if it’s too narrow. Thank you! Narrow hammocks benefit from a natrower hang angle, maybe 20°. Thank you Derek! I’ll give that a try! Hello Derek. I’m hoping to get a custom small mayan made for my 5’1″ frame and was wondering about width/length. Found your website amidst my searching. A typical “single” mayan body looks to be ~3′ wide x ~6′ long with a total length of ~13′. Any suggestions for me? Don’t know how diagonal I can get with 3′ and seems like much of the length would be wasted on me. Happy hanging! That is a good starting point. If you’ve slept in a Mayan hammock you’ll better understand how they stretch and lay. Hammock Rada has some inexpensive Mayan hammocks if you want to try and not invest much. Have you played around with the length much? How short lengthwise do you feel comfortable in? I’ve lounged in a friend’s Mayan before but his was on the much larger scale. Just looking for something comfortable enough and compact. I’d start with an 11 foot hammock at 60 inches wide. Hang angle could go from 30 to 45 degrees. You wouldn’t be able to lay transversal or perpendicular to the hammock in any ENO hammock because they are too short. They can be very wide, but there is a point at which the extra width is a liability because those sides now have to gather together much quicker. It creates a bowl in the middle. You need a longer hammock and one at least 6 ft wide. Most Mayan hammocks like the one you used are more in the 12 to 14 foot length range. The trouble with hammocks that large is that they require much bigger big nets and tarps to cover them, which is one reason camping hammocks are smaller. There are a few modern hammocks that have been made to approximate a perpendicular lay. Check out my review of the Amok Draumr and the Hammock Tent. EXPED also sells one similar called the Ergo. I love a good Mayan or Brazilian hammock indoors where you don’t have to worry about the weight of attachment or accessories. For camping, I recommend a slight compromise by getting a smaller hammock that is better suited for that activity. Camping hammocks with integrated but nets are the most convenient and lightest, but you can mix and match different components to your liking. 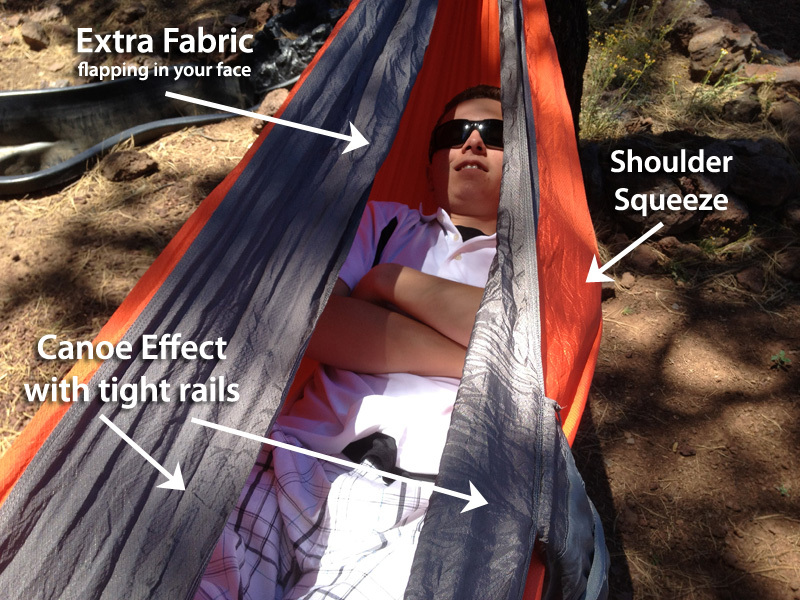 Check out Dream Hammock for a very comfortable and fully customizable hammock. For size, I would start with a 5×11 foot hammock. Thanks so much for the quick reply, Derek! I will check those two out & your reviews! Hey Derek, I’m looking at changing from a traditional bed to a hammock in the next month or so. Is there a big difference between a Brazilian/Mayan style hammock and the modern eno/warbonnet style or is it mainly personal preference? Size is the first, biggest difference. Material is next. Brazilian hammock made from cotton is super comfortable. Your ENO hammock is much shorter and it makes it harder to lay diagonally and use up all the width. Jungle/camping hammocks are also smaller so you don’t have to pack big tarps. Bug nets can be annoying at home unless you need bug protection indoors. However, if you only want to invest in one hammock, is get a jungle style that I could use everywhere. Comfort is very personal and can vary. Your needs are also vary. Awesome, thanks so much for getting back to me! I already have a Hennessy that I use for camping so I’ll look into a Brazilian! Thanks again and keep up to great work! I’m Brazilian and I’ve always slept in hammocks my whole life. I started sleping in bed when I was a child, but gave it up definitively when I was 16, and I can assure that I stopped having back problems while sleeping in hammocks, apart from having a much better quality of sleep. And, jut FYI, I do use mainly indoor hammocks. we should thank Latin American indigenous 4 creating such genial inventions that are hammocks XD wha’ is difference of Mayan to our typical Brazilian hammocks? I didn’t do really find differences..